When I spent a weekend in Porto last year, I had plenty of chances to sample the local cuisine. In fact, my favourite restaurant was not the restaurant at Graham’s called Vinum. I have to admit that Vinum was incredible; both the food and the location were excellent. 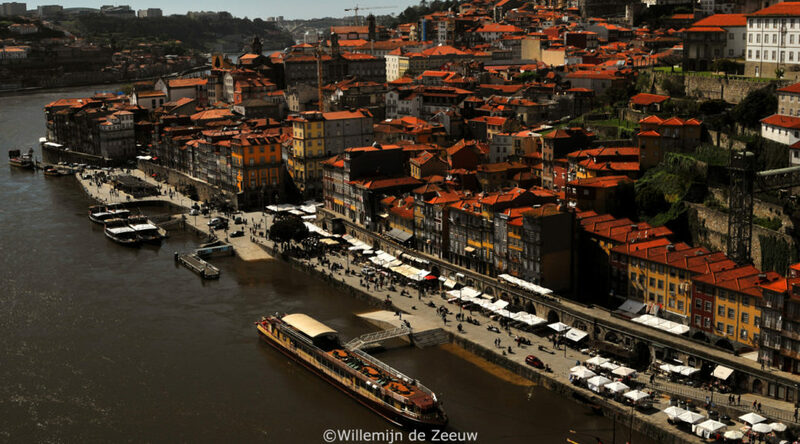 However, my favourite restaurant was a small place at Ribeira’s river front of which I don’t even remember the name. Not because the food was better, but because it was unmistakenly Portuguese. 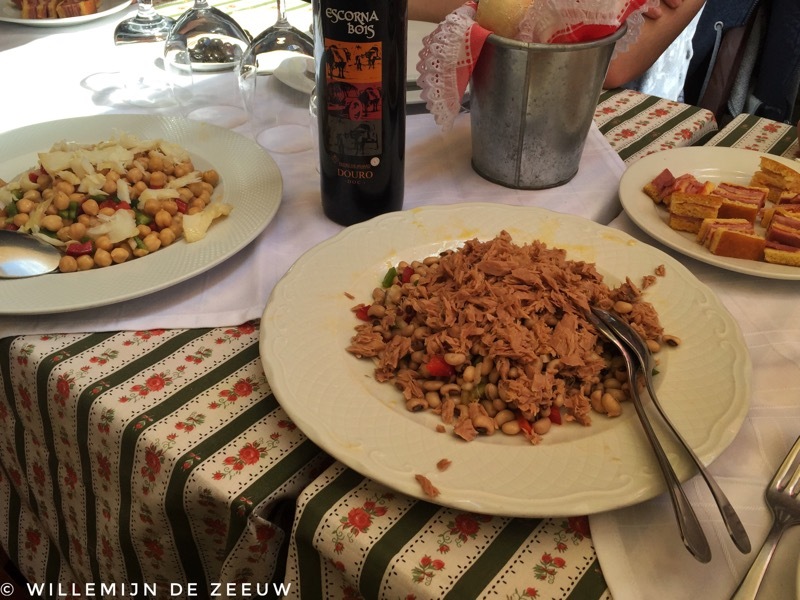 Our lunch consisted of a collection of Portuguese dishes that were nearly all great. The only exception was the tripas a moda do Porto: Porto-style tripe stew. I will not be replicating that recipe. 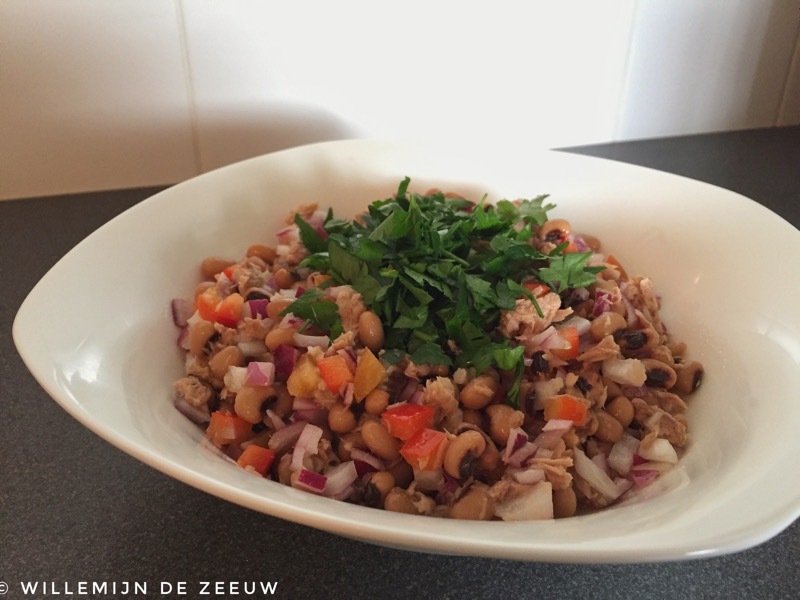 Instead, I would like to share my home made version of the delicious black-eyed beans and tuna salad. Lunch in Porto with black-eyed beans and tuna salad, salt cod and chickpea salad and “bola de carne” (meat filled bread). This recipe is cheap and incredibly simple. Serve this salad as a side dish at a summer barbecue. Serve it for dinner with a chunk of whole wheat bread to mop up all of that tasty vinaigrette. Or prepare it a day in advance and take it with you for a picnic or a healthy office lunch. Although authentic recipes probably prescribe the use of dried beans, I tend to just use beans from a tin. I like to give them a quick rinse under the tap and leave them in the strainer whilst I prepare the rest of the ingredients. Open a tin of tuna a little bit and pour the olive oil into a bowl. Crush two cloves of garlic with a garlic press and add it to the oil. Make a vinaigrette by adding two or three tablespoons of white wine vinegar and a squeeze of fresh lemon juice. Stir to mix the ingredients. You could add salt and pepper at this point, but in my opinion it’s really not necessary. Chop one red onion and a third of a red bell pepper into small pieces. Add them to the vinaigrette and let the mixture sit at room temperature for half an hour to allow the flavours to blend. Roughly chop some fresh flat-leaf parsley. Transfer the beans into a large bowl. 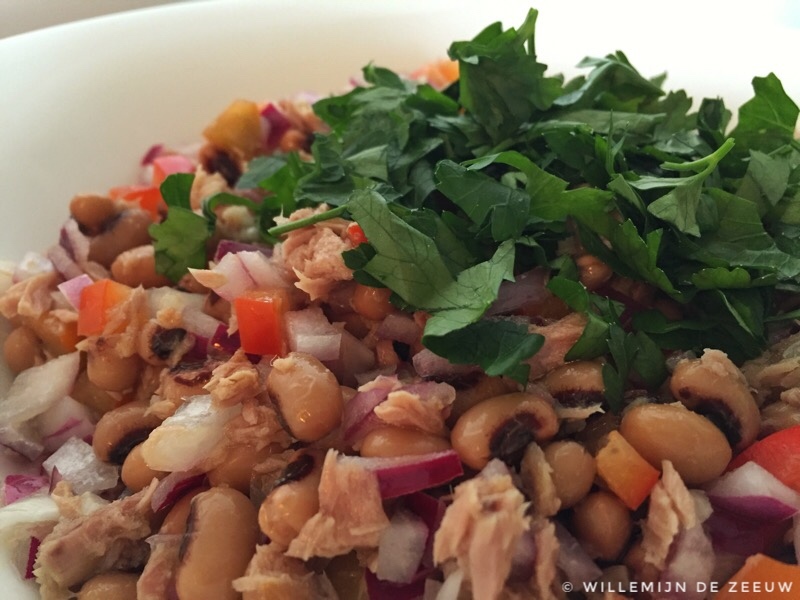 Loosen the tuna with a fork inside the tin and add to the beans. Add the mixture of vinaigrette, onions and pepper and mix well. Sprinkle the salad generously with the freshly chopped parsley. – Drain the tin of beans and rinse them. 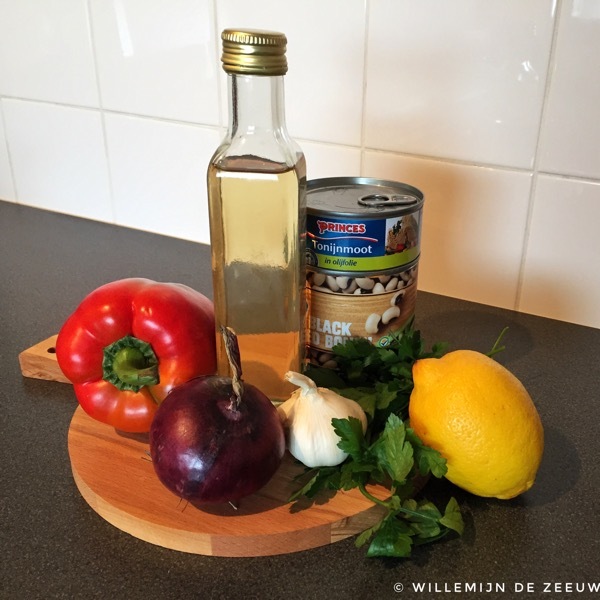 – Open the tin of tuna a little bit and pour the olive oil into a bowl. – Add crushed garlic, white wine vinegar and a squeeze of fresh lemon juice to the oil and give it a stir. 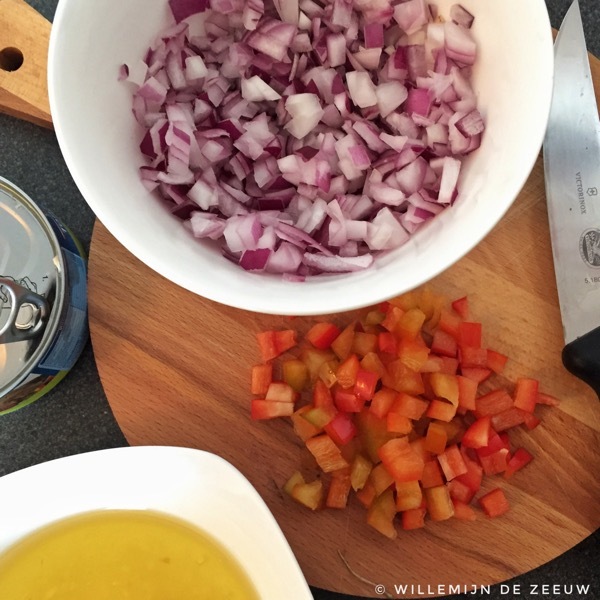 – Finely chop the onion and bell pepper, add to the bowl and leave to marinate at room temperature for half an hour. – Mix all ingredients (except parsley) together in a large bowl. – Sprinkle generously with chopped parsley. What are the best foods you’ve discovered abroad? Have you ever tried to replicate them at home? Has travelling changed what you eat? Please let me know in the comments!